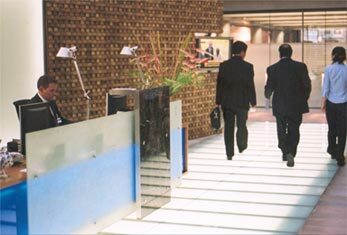 Thoughtfully designed and professionally installed glass flooring can make a spectacular statement in almost any building. Light and Space can be liberated in even the dingiest of existing buildings, and with new buildings, glass flooring offers endless design possibilities. From vision to reality the Roger Wilde LITEFLOOR team is ready to work with you at all stages, from offering technical advice at design concept, through to a complete specialist installation service. 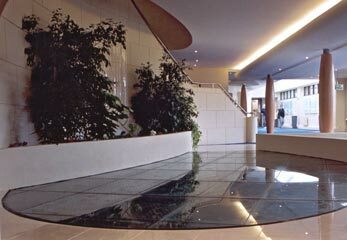 The LITEFLOOR glass flooring system can be used both internally and externally. 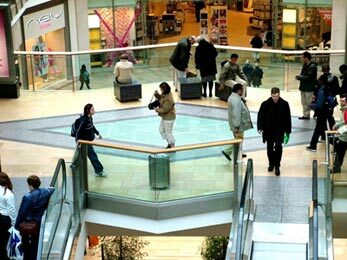 Typical applications can include walkways, bridges and stairs. 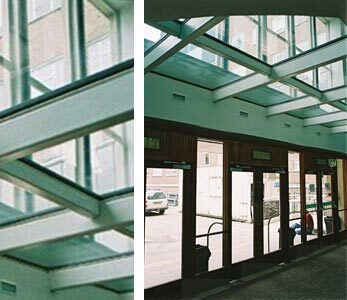 A walkable laminated safety glass with a special slip-resistant coating; LITEFLOOR is typically constructed from three individual sheets of glass. The upper sheet is a heat strengthened safety glass with the slip-resistant coating fused onto the upper surface. The two lower levels are either float or heat-strengthened glass and act as a carrier to the live and dead loads. The highly tear-resistant pvb interlayers hold the glass sheets together thus ensuring the structural integrity of the complete unit. Glass is specified to take a working load capability of 5kN/m2 as standard, or to meet the requirements of BS 6399 Pt 1, as required. Project Specific loadings may also be catered for if defined during the design stage. 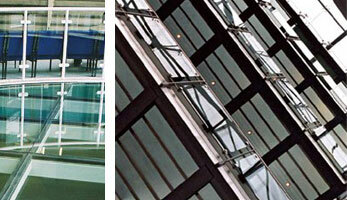 For external applications, Litefloor can be double-glazed and the unit treated to minimise heat-loss from a building. When used externally or in areas exposed to the wet, a pattern giving a minimum coverage of 50% slip-resistant coating is recommended. This coating is available in a range of colours – but a neutral colour such as steel grey is normally recommended for areas exposed to heavy traffic. LITEFLOOR is "made to measure" and there is a wide choice of finishes available as standard. The flooring can be supplied in any shape or size between 20 x 50 cm and 150 x 220 cm. But naturally cost will increase with the complexity of design. Roger Wilde Ltd offers complete design, supply and installation of LITEFLOOR systems including, where required, supporting steelwork. Roger Wilde is unique in also being able to offer its patented Fire-rated Glass flooring system, fully tested to US, British and European standards. If you'd like to know more about LITEFLOOR, or have a project you think we can help you with, please go to the contact page for more details.